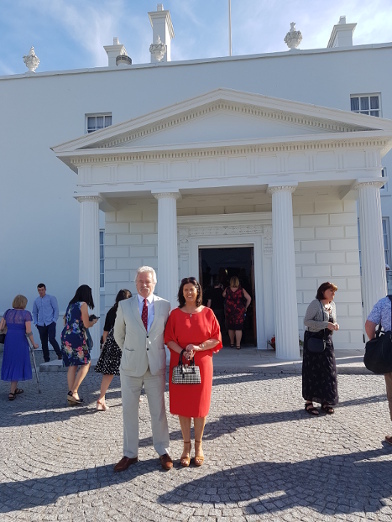 It was a glorious summer’s evening upon arrival at the Áras at 6.00 pm. It began with an extensive tour of both house and gardens. Everyone was exclusively welcomed by the President and his wife Sabina, who were happy to leisurely engage in conversation as well as pose for photographs, with all their guests. An array of appetising canapés and customary refreshments were served, while a proficient Jazz band evoked an eclectic atmosphere with their acoustics. At 8.00 pm, all guests were inside the Marquee for the highlight of the evening, hosted by Eileen Dunne, from RTÉ, as guest compere. President Michael D. Higgins made his open address, followed by an evocative musical performance, from RTÉ’s National Symphony Orchestra. David Brophy was the conductor, and everyone enjoyed the accompaniment of young players from the National Youth Orchestra of Ireland. Two contemporary Irish poets, namely Theo Dorgan and Paula Meehan, delivered live readings of their latest works. A group of young musicians, Navá, who explore the relationship between the ancient musical cultures of Ireland and Persia, entertained the audience with a sample of their folk/ bluegrass music. Other young Irish artists who performed on the night were the violinist, Michelle McCarthy, the soprano, Rachel Croash and pianist, Finghin Collins. The crescendo of the evening was the RTÉ National Symphony Orchestra’s exemplary rendition of ‘Mise Éire’, by popular Irish composerSeán Ó Riada. After the entertainment, guests returned to The Garden Party, enjoying more canapés and refreshments, while the President and his wife Sabina mingled with guests until 10.00 pm. It was an outstanding evening, which showcased the very best of Irish culture, highlighting the youth of Ireland, a cause the President and his wife have always promoted.